Ed seems to have another dark secret, when he visits his dad who is in prison for manslaughter. His visit makes him late for the party at Danny, Lisa and Sandy’s but everyone else seems to be having a brilliant time. Sandy is a little drunk and everyone’s having a laugh. There’s no tension between Danny and Lisa after their night of passion. They don’t want to ruin their friendship. Mubbs, however, teases Lisa. Could he be jealous? 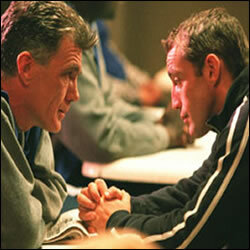 Romance also looks set to blossom when Tony (from Casualty) arrives and Danny introduces him to Ben. The pair are hitting it off, but when Ben moves in for a kiss – Tony runs off. However, just as the party’s getting started, Sandy accidentally starts a fire. There are fireworks in the kitchen, which start exploding and the flat becomes a wall of fire. Everyone gets out safely, until Sandy realises Ben is still in there. Ed and Tony rush back in to get him, and Ben is rescued, but he appears to have inhaled a lot of smoke. He’s admitted to AAU, but Diane can’t say how well he’ll get. A flirty Chrissie congratulates Ed, but he shrugs her off. Despite rejecting his advances, Tony stays with Ben. While Ben can’t work as he’s in a hospital bed, Lisa’s had a visitor, her dad’s back. He tells her that it’s definitely over between him and Lisa’s mother, there’s no way back for them now. Terry bumps into Kath and tries to persuade her to go for a drink to talk things through. He tells her that he misses her but Kath says she’s not going through that again. One of Ed’s patients has a heart attack, and Tom is called back in to perform emergency surgery. While in theatre, Chrissie calls Ed and tells him that his dad has collapsed. Ed appears distracted and Tom orders Ed to leave the theatre. Chrissie, playing her nurses’ card, finds out that Ed’s dad has angina. He’s very upset and tells Chrissie it’s his fault his dad’s in prison. Chrissie follows Ed and asks him what’s wrong. Ed admits that his father is in prison because he took the blame for Ed’s crime. Ed got drunk and got into a fight, lost his temper and hit a man who subsequently died. Ed had newly qualified at the time and his father took the blame to save Ed and so that Ed could become the doctor he’d dreamed of being. Ed cries, saying his dad sacrificed his life so he could be successful. Chrissie hugs Ed and reassures him his secret will go no further. Ed thanks her for being such a good friend, the two gaze at each other, begin to kiss and things get passionate. Chrissie later offers Ed a lift, but he refuses. Is Chrissie playing with fire again? Thankfully, Ben’s going to be alright, and Tony says that the pair of them should meet up when Ben’s better. Meanwhile, Ed goes to see his dad and he hopes they can use his ill health to secure an earlier release date. His father says he’s fine in prison and says how he’s very happy to be inside for Ed and says how proud he is of him. Ed obviously feels the pressure to live up to his father’s expectations but the two warmly embrace. As Ed walks out of the prison, he begins to cry. Ed’s father: You make me proud Ed. Ed: Just get some rest.